The value of money has to be has to be based on something of value. A fiat currency (or fiat money) is one example. The most important thing about money is this: People need to be able to count on its value, and that value needs to be stable over time. For that reason, many countries have, over the past century, shifted to a fiat currency. But what exactly is fiat currency, and what makes it the best alternative? Let's take a closer look. Fiat currency is legal tender whose value is backed by the government that issued it. The U.S. dollar is fiat money, as are the euro and many other major world currencies. This approach differs from money whose value is underpinned by some physical good such as gold or silver, called commodity money. The United States, for example, used a gold standard for most of the late 19th and early 20th century. A person could exchange U.S. currency -- as well as many public and even some private debts -- for gold as late as 1971. A fiat currency's value is underpinned by the strength of the government that issues it, not its worth in gold or silver. US Inflation Rate data by YCharts. The most important aspect of a currency is the relative stability of its value. And while there are certainly more aspects to inflation than just the currency standard, it's a major factor in monetary policy and a government's ability to control the money supply. 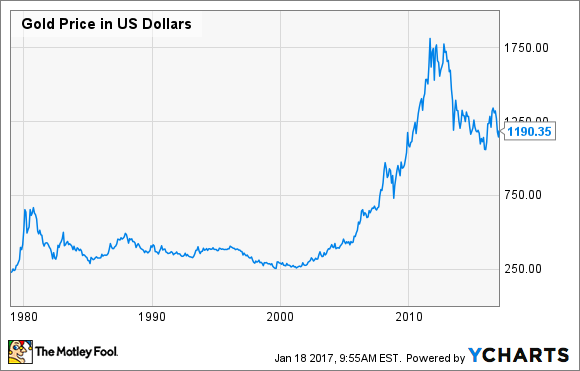 The U.S. dollar -- as well as many public and private debts -- could be converted into gold until the mid-1930s, and the U.S. dollar was tied to the value of gold until the early 1970s, when President Nixon completely severed the relationship between the U.S. dollar and gold. 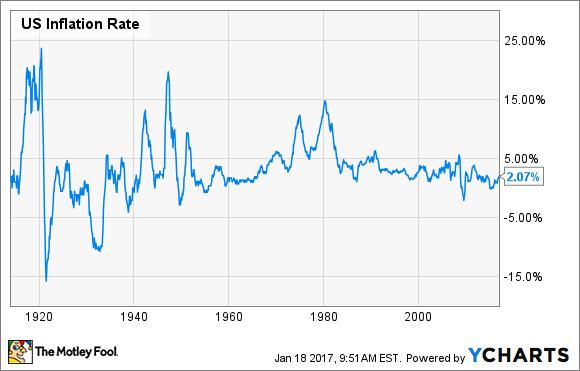 With the exception of the late 1970s' and early 1980s' oil crisis and recession, inflation has become much less volatile, and deflation hasn't been an issue. A key reason is U.S. monetary policy. Since the Federal Reserve has more flexibility to control supply and demand of currency, it is more able to limit the impact of major economic shocks, such as the financial crisis of 2008-2009. Many economists acknowledge that the government's ability to control the supply of currency played a major role in keeping the crisis -- easily the worst in 80 years -- from causing even greater harm to the American and global economy. Those who advocate for a gold or similar standard often use the argument that fiat currencies aren't really "worth" anything, since there isn't anything tangible that underpins its value. That's really not a very accurate description of a fiat currency, versus a gold standard. Simply put, the value of any currency, whether a commodity or a fiat currency, is only relative to what people think it's worth. What does that chart tell us? In times of uncertainty, people hoard gold. You can see it in the early '80s oil crisis and recession and the most recent financial crisis, when gold prices soared, only to fall sharply once the overall economic environment improved. This situation is largely what led Franklin D. Roosevelt to sever the convertibility of U.S. currency and debt into gold during the Great Depression. Under the gold standard (especially when currency could be converted to gold), hoarding gold had a direct impact on monetary flow, hurting commerce and exacerbating recessions. By severing the link between gold reserves and currency, the Federal Reserve is better able to combat major economic shocks to the economy. 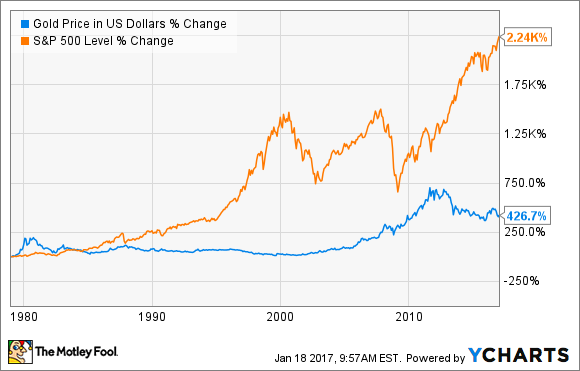 The U.S. stock market has been a far superior long-term investment since Nixon severed the relationship between gold and the dollar in the 1970s. And since September 2012, gold has fallen 30%, while the S&P 500 has seen total returns of more than 77%. It's fair to argue that the Federal Reserve's efforts to limit the impact of economic crisis could have unforeseen long-term effects, based on the additional money that has been put in circulation, versus a gold or silver standard that limits how much money circulates. The problem gets back to times of major economic crisis: When governments need tools to stop or reduce the harm, a commodity standard has historically had the opposite effect as people hoard it. By severing the tie between a commodity that people tend to hoard in times of crisis and the value and supply of money, a fiat currency is a better alternative, but only so long as those pulling the levers of monetary supply keep the balance between supply and demand stable. Here's the bottom line: Currency is a tool of trade. People tend to hoard gold and silver when things are uncertain, and that's harmful when it limits currency flows on a large scale. Removing the relationship between a currency and commodity doesn't create "worthless money." It simply keeps panic from causing greater economic harm in times of crisis when people hoard the underpinning of a commodity currency and stop the wheels of commerce. And that makes a fiat currency far better than a gold standard.